Striped Bass - Fishing with Gus! 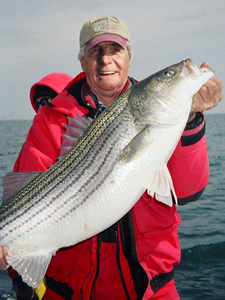 Striped Bass are sometimes referred to as “the nomads of the inland seas.” I heard a story several years ago about Lake Norman Stripers being tracked with radio transmitters. One particular fish traveled 17 miles in a 24-hour period. Stripers are constantly moving while searching for food and ideal water conditions. This steady movement makes them a worthy adversary. Hunters suggest that striper fishing is similar to stalking deer or elk. During the spring spawning run, stripers migrate very long distances in certain fresh water impoundments. Spawning seasons aside, stripers might travel many miles daily. Movement can be both vertical and horizontal over a lake’s bottom. When water conditions warrant, they spend considerable time in the depths of the lake. Their deep water movement from one section of the lake to another may be detected with a depth/fish finder of good quality. Capt. Gus can lead you to striped bass on Lake Norman. Call or book your trip online today for a wonderful fishing adventure with Capt.